The WISB lab went on the road in Autumn 2016 to give children from a number of local schools the chance to try their hand at synthetic biology. WISB Researchers worked alongside FabLab Coventry, the Midlands Academy Trust, and Think Higher to deliver an interactive and engaging short-course programme that was centred on synthetic biology, related STEM subject areas, scientific techniques and principles. 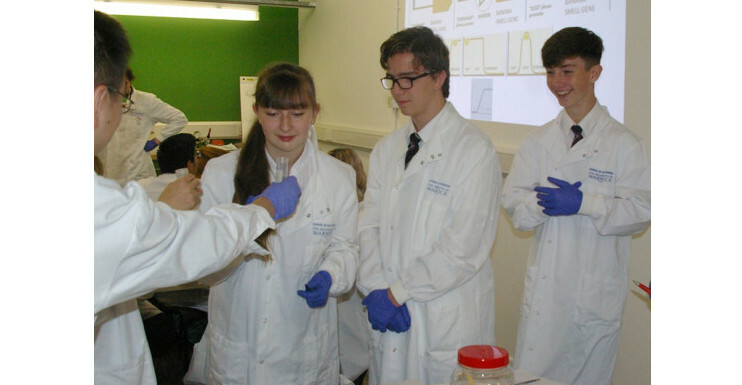 Over two days, Year 10 Students took part in a series of synthetic biology experiments. Following the eau that smell protocol they used their noses to test if their E. coli had been genetically engineered to produce a banana scent. Through this work they learnt about a new frontier of research and the implications for society. They also had an opportunity to find out what University could do for them. FabLab Coventry is a not-for-profit partnership between Coventry University, Coventry City Council, the University of Warwick, and other partners from both the private and charity sectors.